Notts Outlaws will be looking to return to when winning ways when they travel to New Road to face Worcestershire Rapids in Sunday’s televised NatWest T20 Blast fixture. 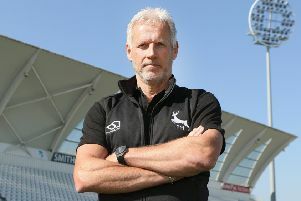 After playing all of their opening four matches at Trent Bridge, the Outlaws head for Worcester off the back of Friday evening’s unexpected defeat to Leicestershire Foxes, a result and performance that Mick Newell termed ‘unacceptable’. Newell, Notts’ director of cricket, saw his normally free-flowing top order stutter and fail to reach 150, before defeat was confirmed by the awarding of penalty runs after his side failed to bowl their overs in the allotted time. Jake Ball was again the pick of the Outlaws attack on Friday, picking up three wickets at the end of a week that had seen him also record career-best figures of six for 49 in the championship win over Sussex. Defeat to their local rivals was a tough pill for the Outlaws’ to stomach, having sent out a side crammed full of attacking firepower, both with bat and ball. England’s Stuart Broad played, making his first T20 appearance for his county since finals day in 2010. He won’t be available for the New Road clash but another seasoned international is ready to step in and replace him. Australia’s Ben Hilfenhaus has joined the Trent Bridge ranks for the remainder of the season and is eager to sample county cricket for the first time in his career. Hilfenhaus will step into an eleven that will also include both Alex Hales and James Taylor, prior to them linking up with the England squad for the forthcoming One Day International series against New Zealand.